This is odd. Since when did religious advertisements have to conform to a particular interpretation of messianic eschatology? Since when was it the task of the ASA to discern between mythical symbols and promised realities? If the remit of the ASA now extends to determining theological orthodoxy, what hope is there for billboards proclaiming ‘Jesus is Lord’? Don’t Christians, Muslims, Jews, Hindus, Sikhs and Jedi Knights all have notions of a ‘lord’ in their beliefs? Might not adherents of any non-Christian religion find such a declaration offensive? The Advertising Standards Agency confirmed to Christian Today it has received 33 complaints so far about the adverts. A spokesman said people have claimed the post is ‘misleading because they believe it is not consistent with the teachings of the Quran’. Since when did religious advertisements have to be consistent with the teachings of the Qur’an? This is a time for the ASA to recognise a coordinated campaign of sharia censorship when they see one, and to resist attempts to infringe the fundamental freedom of expression or impinge upon anyone’s freedom of religion; the freedom to proclaim one’s faith in the marketplace and to live in accordance with its precepts. 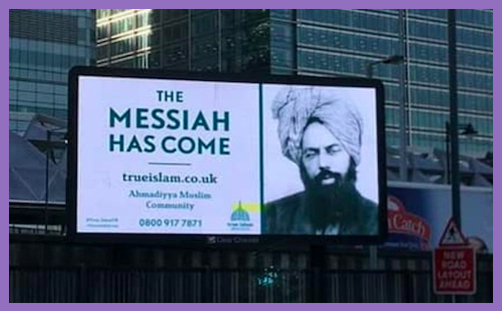 Ahmadiyya Muslims ought to be perfectly free to declare on billboards that the Messiah has come. Of course, if you prefer, you can choose to be offended and gripe to the ASA. And doubtless much fruit will come of it.